Because it barely protrudes, the Brompton Folding Left Hand Pedal contributes to the bike's neat fold. All today's Bromptons come supplied with a Folding Left Hand Pedal. If you have an older model, you might want to upgrade it with one of these. 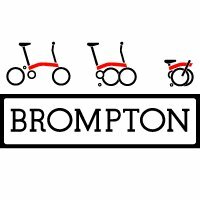 All today's Bromptons come supplied with a Folding Left Hand Pedal. If you have an older model, you might want to upgrade it with one of these.